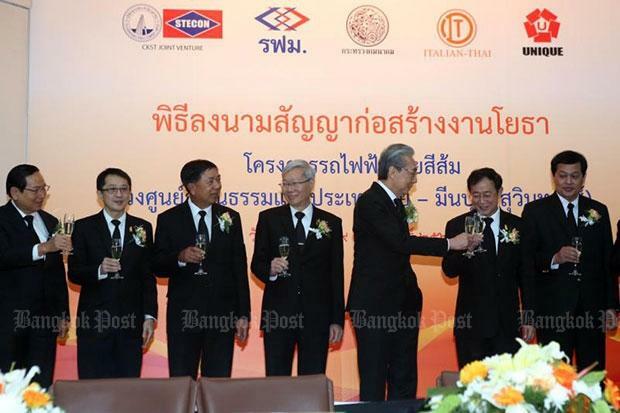 Deputy Prime Minister Somkid Jatusripitak, (third from right), on Thursday presides over a contract-signing ceremony for construction of the Orange Line electric rail route, involving six contracts worth 79.2 billion baht. The Mass Rapid Transit Authority of Thailand (MRTA) on Thursday signed six contracts for the construction of the 79.2 bilion-baht Orange Line electric rail route, expected to open in early 2023. Deputy Prime Minister Somkid Jatusripitak presided over the signing of the contracts for construction of the Orange Line, linking the Thailand Cultural Centre and Bangkok’s Min Buri district, with the winning bidders. There are six contracts worth a total of 79.2 billion baht, below the median prices by 505 million baht. Construction is to begin by the end of this year and is due for competition in Jan 2023. The Orange Line is expected to open in early 2023. The 22.57 kilometre route will have 17 stations, 10 subway and 7 elevated. MRTA governor Peerayuth Singpattanakul said the first contract was for a 6.29km rail system from the Thailand Cultural Centre to Ramkhamhaeng 12. It was won by CKST Joint Venture. CKST Joint Venture comprises CH Karnchang Plc and Sino-Thai Engineering and Construction Plc, and Italian-Thai Development Plc and Unique Engineering and Construction Co. The second contract, comprising tunnels and four subway stations with a distance of 3.44 km, was also won by CKST, the MRTA governor said. Italian-Thai Development Plc was awarded the third contract, which included design and construction of underground tunnels and three subway stations. It covers a distance of 4.04km from Hua Mak-Khlong Ban Ma on Ramkhamhaeng Road. Unique Engineering and Construction Co won the fourth contract, to build a section of the elevated track between Khlong Ban Ma and Suwinthawong Road in Min Buri. It will have 7 stations. CKST was awarded the fifth contract to build maintenance depots and parking buildings. Unique Engineering and Construction Co won the sixth contract to design and construct the tracks from the Thailand Cultural Centre to Surinthawong, said Mr Peerayuth.